It’s a known fact that foodies, bloggers, and hipsters love to post artsy photos of their food. Making tasty desserts look good in pictures can be a lot harder than it looks. So how do all the top food bloggers do it? What photography strategies do the experts and food connoisseurs use? If you’re feasting upon a Mochi Ice Cream and feel inspired to create the ideal Instagram post, check out our tips below. Take advantage of different textures, surfaces, and patterns in your home and outdoors when taking a photo. Set your Mochi atop a charming marble countertop, or utilize your new decorative placemats to set the scene for your photo. 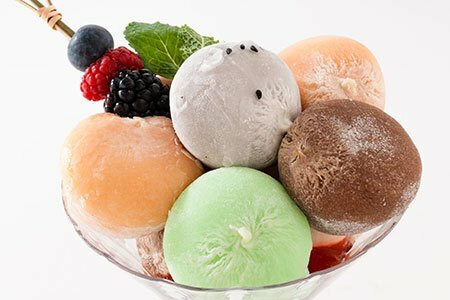 Discover hundreds of different ways to arrange your Mochi Ice Cream with doilies. A doily adds an instant touch of dainty elegance to any ice cream instagram post. Step up your insta game and have a pack of doilies on hand for impromptu snapshots. Make sure that you’re using color strategically to emphasize your ice cream. Setting your Mochi Ice Cream in front of a bright pink wall or on top of a patterned table will help to create the contrast you need for a stunning image. Colorful silks, felts, and even a sassy hint of vinyl can add a little edge to a photo. Display your dessert atop a playful fabric or vibrant tapestry. A quick trip to the local craft store can provide you with an assortment of fun fabrics to take your ice cream photography skills to the next level. A wooden cutting provides a clean, textured background for an outstanding foodie image. Whip out your cutting board from the drawer and arrange a series of Mochi Ice Cream across it. Take your photo from above and create the perfect post to showcase just how tasty your Mochi are. We all have a favorite dish or glass in our pantries. Maybe you’ve got a splashy plate that you’d like to use for a picture, or a cute martini glass you’d like to place your Mochi inside. Dishes and glassware are great to accentuate the natural shape and beauty of the perfect Mochi ball! Playing with different shapes and sizes is a unique and fun way to eat and style your Mochi for a drool-worthy instagram post. Grab your kitchen knives and get crafty with your Mochi. We love how Mochi looks sliced into four and laid out on a dish. This creates the look of sweet ice cream tapas, cut up into delectable bite sized pieces. Arrange them in a spiral or side by side and snap as many photos as you like before you devour them! Reveal the ambrosial ice cream inside your Mochi by slicing it in half. This is an excellent way to unveil the inner goodness within the doughy rice layer. Photograph both halves or just one for an instagram post that is sure to go viral. A creative way to eat and display your Mochi Ice Cream is to make a Mochi Ice Cream kabob. Making Mochi into easy-to-eat hors d’oeuvres will not only photograph well, but will be a delicious treat after your instagram post is complete! Pick up some wooden skewers and build an appetizing Mochi kabob! Zoom in, zoom out, shoot from above, or crop your pic into a snazzy closeup. Be inventive and original with your angles to show different perspectives. Take a photo lying down, sitting down, or up above. Go wide with your angles, utilize reflections, or even take photos underwater. Getting crafty with your angles is one of the most exciting ways to spice up a photo. Valencia highlights your photo with an over-exposed wash that filters out impurities and plays off the lighting in your image. Valencia is an ideal photo filter for Mochi pics, as it will make the mochi colors look absolutely flawless. For a more dramatic look, choose the Hudson filter. The Hudson filter alters the lighting in your photos, creating a sharper, icy feel. With an almost bluish, deeper tinge, Hudson is an excellent filter if you’re in the mood for a more poignant image. Make your Mochi pop with the colorful Lo-Fi filter on instagram. Lo-Fi saturates the colors in your images, which is great to emphasize the fun Mochi colors. Lo-Fi is perfect for green tea or strawberry mochi ice cream, and will really make the colors stand out. Make sure to use an up to date smart phone for the highest quality images. Low resolution photos will receive less likes, and won’t showcase the true delicacy of your Mochi Ice Cream.